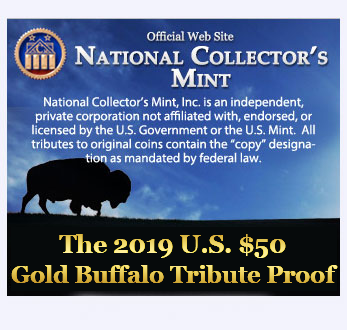 National Collector's Mint, Inc. is an independent, private corporation not affiliated with, endorsed, or licensed by the U.S. government or the U.S. Mint. All tributes to original coins contain the "copy" designation as mandated by federal law. OWN A SYMBOL OF AMERICAN HISTORY! 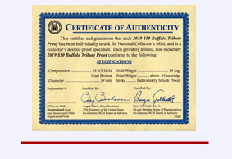 Each 2019 $50 Gold Buffalo Tribute Proof comes complete with Certificate of Authenticity, verifying that each piece is clad in 14 mgs. 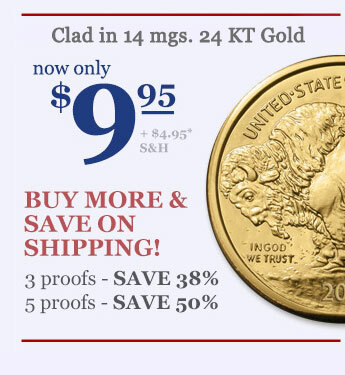 of 24 KT Gold, is Proof Struck and is based on the famous design of James Earle Fraser’s iconic Buffalo Nickel. Recreates the first .9999 fine 24-karat gold coin struck by the U.S. Government and one of the purest gold coins ever minted! Mint's private non-monetary minting recreates James Earle Fraser’s American Buffalo against a mirror-like background on one side and his iconic Native American Indian Head stands out in stunning relief on the other. The final issue price was to be set at $50 per proof. But, during our special release, this 24 KT Gold clad masterpiece can be yours for only $9.95 plus s&h. 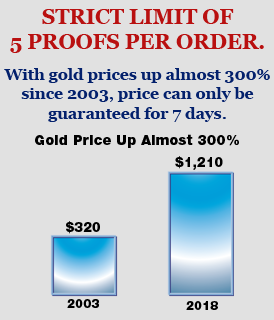 With gold prices up almost 300% since 2003, price can only be guaranteed for 7 days. Limit 5 per order. 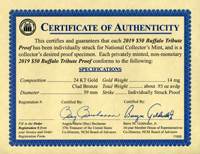 Each 2019 $50 Gold Buffalo Tribute Proof comes complete with Certificate of Authenticity, verifying that each piece is clad in 14 mgs. of 24 KT Gold, is Proof Struck and is based on the famous design of James Earle Fraser's iconic Buffalo Nickel. 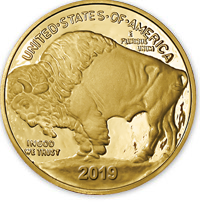 Purchase one 2019 $50 Gold Buffalo Tribute Proof today for $9.95 + $4.95 S&H. By clicking the Process Order button you are placing a live order and agreeing to the terms of our 60-Day Money-Back Guarantee and our Arbitration Terms. WE APPRECIATE YOUR PATRONAGE.